The critics tore his performance to shreds. Her second novel was ripped to shreds by the critics. My trousers were torn to shreds when I fell off my bike. The intruders had torn the house to shreds. The statue of the dictator was toppled (over) by the crowds. The tree toppled and fell. A large tree was toppled by the wind. This town is a cultural wasteland. The car was dumped in a stretch of wasteland in the south of the city. Rain forests are being transformed into barren wasteland. Television is a vast wasteland. The tornado has already left a trail of devastation through four states from Nebraska to Missouri. Western India was devastated by a huge earthquake. The town was devastated by a hurricane in 1928. All the facts of the investigation are finally being laid bare. It’s been promoted as the biography that lays bare the truth behind the legend. The explosion ripped the bus apart. We spent the weekend stripping wallpaper. The wind had stripped the leaves from the trees. Because of the pollution, the trees are almost completely stripped of bark. The paintwork was so bad that we decided to strip off all the paint and start again. During the summer months, the sheep strip the mountains bare. He’s barely 12 years old. They had travelled barely a third of the way. Her husband died in the accident but she, amazingly, escaped unscathed. I came away from the accident unscathed, but the car got badly damaged. The government has emerged from this latest crisis relatively unscathed. Swirl a little oil around the frying pan. The fog swirled thickly around us. Snowflakes were swirling all around us. John swirled the ice around in the bottom of his glass. 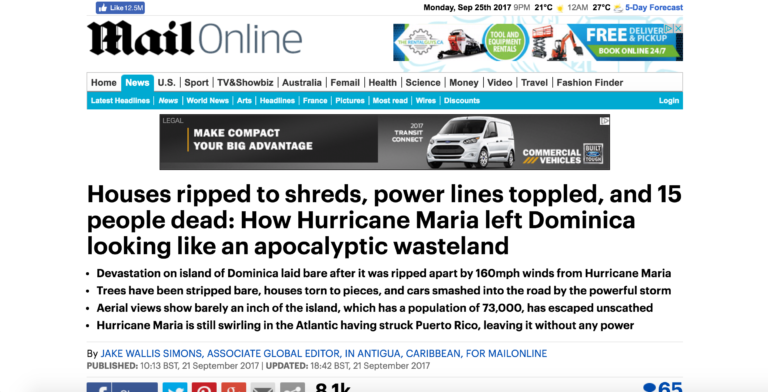 The post-apocalyptic destruction on Dominica has been laid bare in an exclusive set of pictures after the island was ravaged by Hurricane Maria. 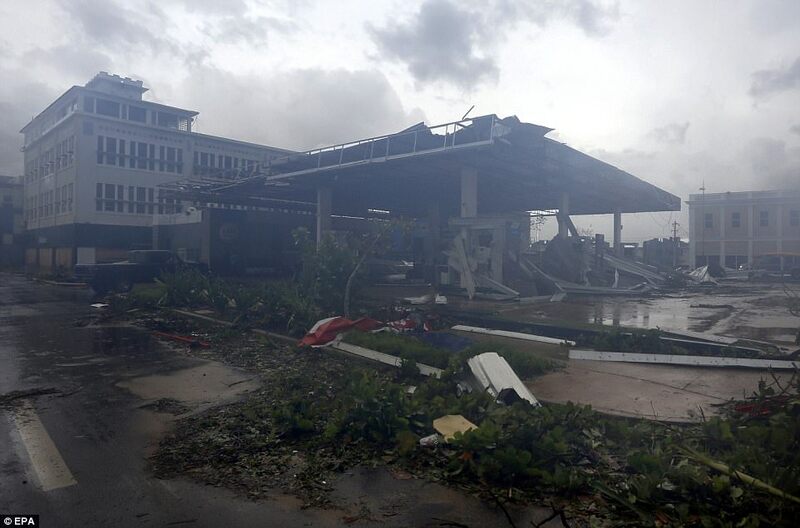 Houses have been torn to pieces, trees stripped bare and a car slammed into a road by falling debris after 160mph winds ripped through the Caribbean paradise to pieces and turned it into a nightmare leaving 15 dead. In photographs taken on the ground, bewildered Dominicans can be seen wandering amid the wreckage of their homes. Buildings are completely destroyed, while a plume of black smoke curls into the air on the horizon. The area has been ravaged by drought/floods/war. Hurricane Mitch ravaged the tiny Central American country. The truck slammed into an oncoming car. The wind made the door/window slam (shut). Close the door carefully, don’t slam it. He slammed the groceries down on the table. The explosion ripped through her home. The explosion ripped through the hotel. 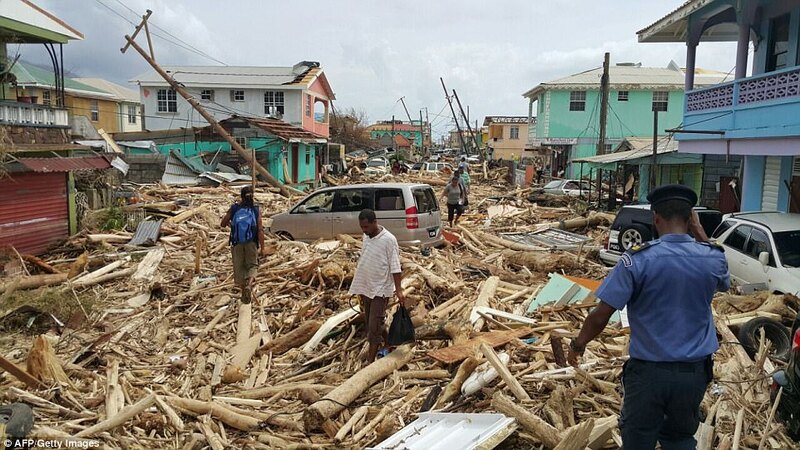 A hurricane ripped through the Caribbean. The pilot was trapped in the wreckage for almost seven hours. Two children were trapped in the wreckage. The wreckage of the car was scattered over the roadside. There was a loud explosion, followed by a plume of thick black smoke. A black plume of smoke rose from the ship. Smoke curled from tall chimneys. The pages had begun to turn yellowand curl. Her lip curled at what he said. She curled her lip in disgust at the suggestion. 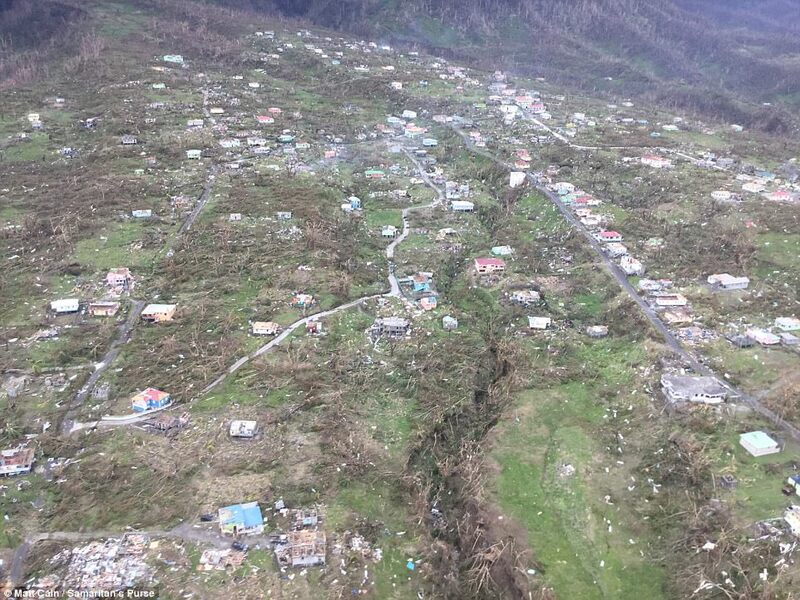 A set of aerial photographs further illustrates the scale of the devastation suffered by the island, which has been under total communications blackout since the storm. The pictures show row upon row of ruined houses with debris strewn all around. Entire forests have been stripped bare by the winds, and not a dwelling appears unscathed. 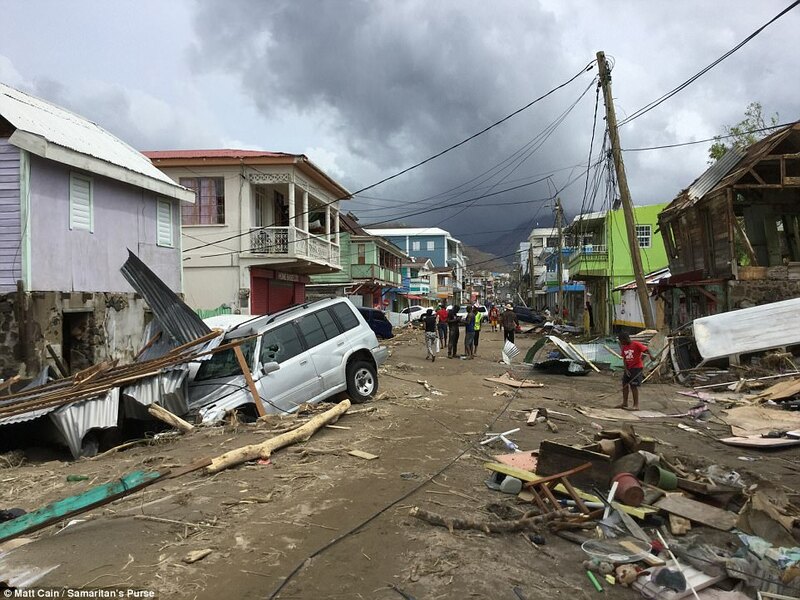 Although Dominica has a population of 73,000 people, the phone lines, internet and electricity are down, meaning that almost no news or pictures have emerged from the country since Maria struck. Dominica is known as the ‘Island of 365 rivers’ on account of its numerous bodies of water that flow down the mountainous terrain of the island. She could see row upon row of people waiting to be served. One room was strewn with children’s toys. Wine bottles and dirty dishes were strewn across the lawn. Her clothes lay strewn on the floor. The park was strewn with litter after the concert. There is an estimated shortfall of some five million dwellings across the country. She can’t work much on account of the children. He doesn’t drink alcohol on account of his poor health. Lava from the volcano was flowing down the hillside. Hot water flows through the pipes. Many rivers flow into the Pacific Ocean. The car handles particularly well on rough terrain. This, however, has left the territory prone to mudslides which have contributed to the mounting death toll. At least seven people have been confirmed killed by the hurricane, and that number is expected to rise dramatically. Hartley Henry, an adviser to the prime minister, Roosevelt Skerrit, said there had been a ‘tremendous loss of housing and public buildings’. Henry said that he had spoken to Skerrit – whose residence was destroyed by the hurricane, forcing his rescue – on a satellite phone. ‘He and family are fine. Dominica is not,’ he said. ‘The main general hospital took a beating. Patient care has been compromised. Many buildings serving as shelters lost roofs, which means that a very urgent need now is tarpaulins and other roofing materials. The coastal region is prone to earthquakes. He’s prone to gain weight. This stretch of road is prone to foggy patches. I‘ve always been prone to headaches. As a child, he was prone to ear infections. There’s been mounting international criticism of the move. They were making a tremendous amount of noise last night. She is under tremendous pressure at work. We have a tremendous amount of work to get through. I have tremendous respect for my parents. The building is partly a museum and partly a private residence. Property firms have taken a beating on the stock market. This chair has taken a beating over the years (= been used often and damaged). Well, you want $400 and I say $300, so let’s compromise at/on $350. Don’t compromise your beliefs/principles for the sake of being accepted. We would never compromise the safety of our passengers. The problem is becoming increasingly urgent. The most urgent thing in a fire is to make sure everyone is out of the building. The refugees are in urgent need of food. Many people are in urgent need of food and water. Dominica was among the Caribbean Islands worst affected by the hurricanes, destroying the house of prime minister Roosevelt Skerrit, who had to be rescued. The 44-year-old, who has led the country since 2004, said he had been at the ‘complete mercy of the hurricane’ which he described as ‘rough, rough, rough’ before making it to safety. The police never actually determined the cause of death. It is the responsibility of the court to determine whether these men are innocent. I can’t determine why your phone isn’t working. The investigation determined that the death was accidental. She waded across the stream to get the ball. The river was full but we managed to wade across. We waded a shallow river. They had to wade through a swamp. We rolled up our trousers and waded at the edge of the lake. After you’ve been through immigration (control), you can go and get your luggage. Burglars looted cash and mobiles from a shop in Tagore Town. Riot police were sent to prevent the mob from looting. Workers are entirely at the mercy of dishonest employers. Poor people are increasingly at the mercy of money-lenders. Fishermen are always at the mercy of the forces of nature . Be persistent – don’t give up. She is a persistent offender and has been arrested five times this year for shoplifting. Photos from elsewhere on the island show gas stations have been destroyed, hampering repair efforts as machines that could have helped lie idle or damaged. Elsewhere the streets are littered with branches torn from trees that have been stripped of their bark by the sheer force of the storm. Trees lie scattered around having been torn out of the ground, mirroring the power lines that have been toppled into the streets, cutting electricity from thousands of homes. On the nearby island of Puerto Rico, Maria left the entire island without power, as officials warned that it could be out for months while they try to repair the damage. The true extent of the devastation is still not known as the government has not been able to conduct a fly-over of the island to assess the scale of the damage. While Maria had dropped to a Category 2 storm after becoming the strongest hurricane to hit Puerto Rico in 100 years, it strengthened to a Category 3 on Wednesday as it neared the Dominican Republic. The report looks at economic growth in Europe and elsewhere. They couldn’t find what they wanted and decided to look elsewhere. It’s hot and sunny on the coast but not elsewhere. Fierce storms have been hampering rescue efforts and there is now little chance of finding more survivors. The search was hampered by heavy snowfall. Valuable machinery is left to lie idle for long periods. Half these factories now stand idle. The machines are standing idle because there are no spare parts. It’s crazy to have £7,000 sitting idle in the bank. The park was littered with bottles and cans after the concert. Maya succeeded through sheer hard work. We were overwhelmed by the sheer volume of work. The suggestion is sheer nonsense. It was sheer chance that we met. We were shocked by the extent of the damage. The government underestimated the extent of the contamination. We didn’t know the extent of his injuries. They assessed the cost of the flood damage at £2,500. We need to assess whether the project is worth doing. Government officials assessed the flood damage in the millions of dollars. Our agent will assess the value of your property. The bridge will need to be strengthened. Exercise will strengthen your legs. Doctors say his injured shoulder will take time to strengthen. The tone of her voice strengthened suddenly. 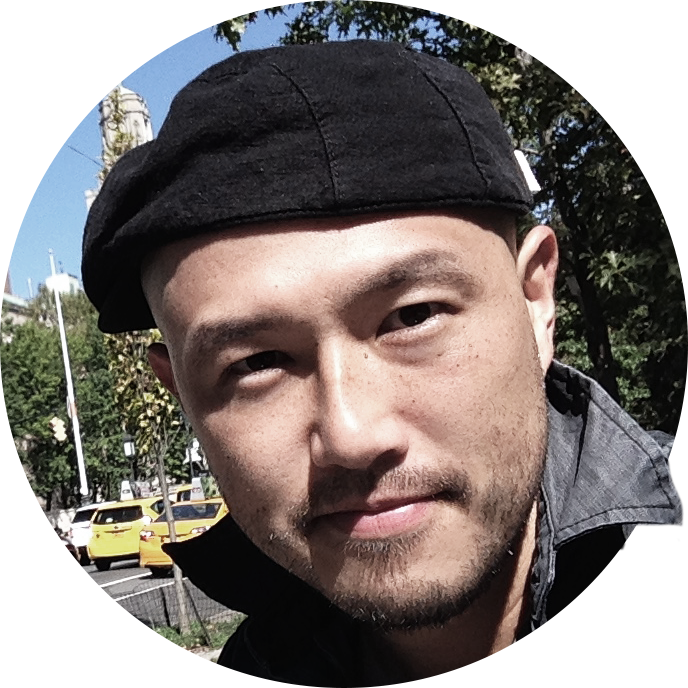 His battle against cancer has strengthened his belief in God. The concrete is strengthened with steel rods. The truck picked up speed slowly. A hurricane was churning up the bay. The water was churning and the boat was rocking. The fish churned up the water when we threw them some food. The flood water surged down the little street. The crowd surged onto the field after the game ended. The crowd surged forward towards the police. There are few indications (that) the economy is on an upswing.